When you’ve found the love of your life, you want the world to know. Diamond promise rings let you show your lifelong love to that very special woman. Diamonds are forever, and so is your love. Knowing exactly the type of ring to purchase can be a bit overwhelming when there’s so many different styles and meanings attached to them. If you’re feeling a bit confused, don’t worry; understanding the difference between engagement rings, wedding bands, and anniversary rings typically requires a little explanation. Engagement rings: An engagement ring is given to a woman as a promise of his love forever. Most men present the woman with the ring when proposing marriage, but it’s also common for women to accept a marriage proposal, then help her fiancée choose the perfect ring. Diamond promise rings are commonly solitaire, often with smaller diamonds flanking the sides of one larger stone. Wedding Rings: Otherwise known as wedding bands, these rings are exchanged during the marriage ceremony. 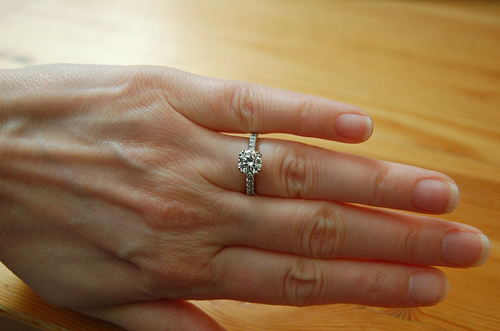 The woman typically chooses a band matching her engagement ring, so the two can be worn together. Most men also opt to wear a wedding band; however, it is a personal preference, so many also opt not to. Anniversary Rings: Many men choose to present their wives with a special third ring to mark a milestone anniversary, the birth of a child, or just to show her he’s still as committed to her as the day they said their vows. Eternity Rings: A popular style for all occasions is the eternity ring. Diamonds go all the way around the ring to symbolize everlasting love. Additional styles ─ half eternity rings and sizeable eternity rings ─ are also available if you want to be able to adjust for sizing, as full eternity rings cannot be amended due to the diamonds all the way around the band. There’s no better way to promise your love forever than with a stunning diamond ring. Whether you’re looking for simple elegance, such as our Bezel set Classic Semi Eternity Diamond Ring or major glamour, like our Invisible set Diamond Half Eternity Ring (3 1/2 ct.), we have what it takes to bring a smile to her face.